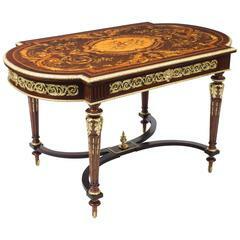 This is a fine and rare antique ormolu mounted French kingwood bureau plat after Charles Cressent, circa 1860 in date. It has highly decorative ormolu mounts and the underside bears a Bedel & Cie., label. The shaped rectangular top has a decorative ormolu border and is inset with a superb gilt-tooled tan leather writing surface. It has one long central and two short shaped frieze drawers on one side and false drawers on the other. It is raised on cabriole legs headed by stunning scrolled foliate and shell cast Venus mask espagnolettes and terminating in ormolu lion's paw sabots. Each side is mounted with an acanthus, scroll and lambrequin adorned ormolu Diana Mask. It is freestanding and finished on all sides so that it can stand freely in the centre of a room. This example follows the celebrated Charles Cressent model, one of which forms part of the renowned collection at the John Paul Getty Museum in Los Angeles. Complete with working locks and key. This is a truly lovely piece which will display beautifully in any interior. Condition: In excellent condition having been beautifully cleaned and polished in our workshops, please see photos for confirmation. Dimensions in cm: Height 82 x width 209 x depth 106 Dimensions in inches: Height 32.3 x width 82.3 x depth 41.7 Ormolu (from French 'or moulu', signifying ground or pounded gold) is an 18th-century English term for applying finely ground, high-carat gold in a mercury amalgam to an object of bronze.The mercury is driven off in a kiln leaving behind a gold-coloured veneer known as 'gilt bronze'. The manufacture of true ormolu employs a process known as mercury-gilding or fire-gilding, in which a solution of nitrate of mercury is applied to a piece of copper, brass, or bronze, followed by the application of an amalgam of gold and mercury. The item was then exposed to extreme heat until the mercury burned off and the gold remained, adhered to the metal object. Kingwood is a classic furniture wood, almost exclusively used for inlays on very fine furniture. Occasionally it is used in the solid for small items and turned work, including parts of billiard cues, e.g., those made by John Parris. It is brownish-purple with many fine darker stripes and occasional irregular swirls. Occasionally it contains pale streaks of a similar colour to sapwood. The wood is very dense and hard and can be brought to a spectacular finish. it turns well but due to its density and hardness can be difficult to work with hand tools. It also has a tendency to blunt the tools due to its abrasive properties.